It's easy to imagine how you'd raise a boy-all the golf outings, lawnmower lessons, and Little League championships you'd attend-but playing dad to a little princess may take some education. 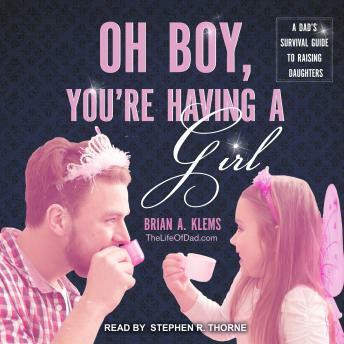 In Oh Boy, You're Having a Girl, Brian, a father of three girls, shares his tactics for surviving this new and glittery world. From baby dolls and bedtime rituals to potty training and dance recitals, he leads you through all the trials and tribulations you'll face as you're raising your daughter. He'll also show you how to navigate your way through tough situations, like making sure that she doesn't start dating until she's fifty. Complete with commandments for restroom trips and properly participating in a tea party, Oh Boy, You're Having a Girl will brace you for all those hours playing house-and psych you up for the awesomeness of raising a daughter who has you lovingly wrapped around her little finger.